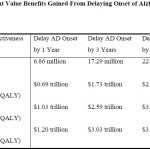 If an Alzheimer's disease treatment breakthrough that delayed the age of onset by 5 years were introduced in 2015, by 2050 the total reduction in cost of care for people with the disease (for all payers) would be $447 billion. This is a decrease from the expected $1.078 trillion to $631 billion. 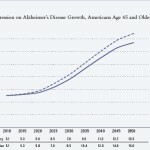 If an Alzheimer’s disease treatment breakthrough that delayed the age of onset by 5 years were introduced in 2015, by 2050 the total reduction in cost of care for people with the disease (for all payers) would be $447 billion. This is a decrease from the expected $1.078 trillion to $631 billion.